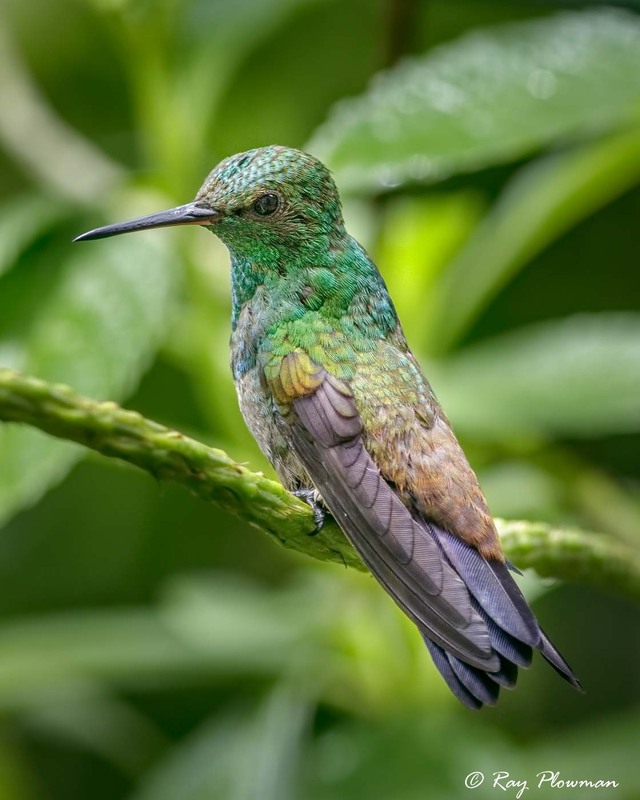 Hummingbirds belong to Trochilidae family placed in Order Caprimulgiformes. 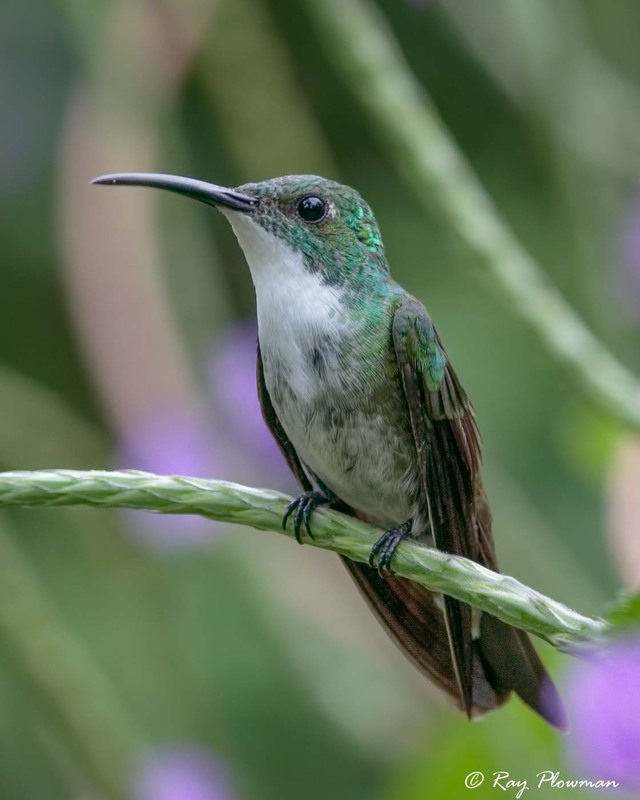 The gallery features six species photographed in Trinidad, which is geographically part of South America and unlike most Caribbean islands. 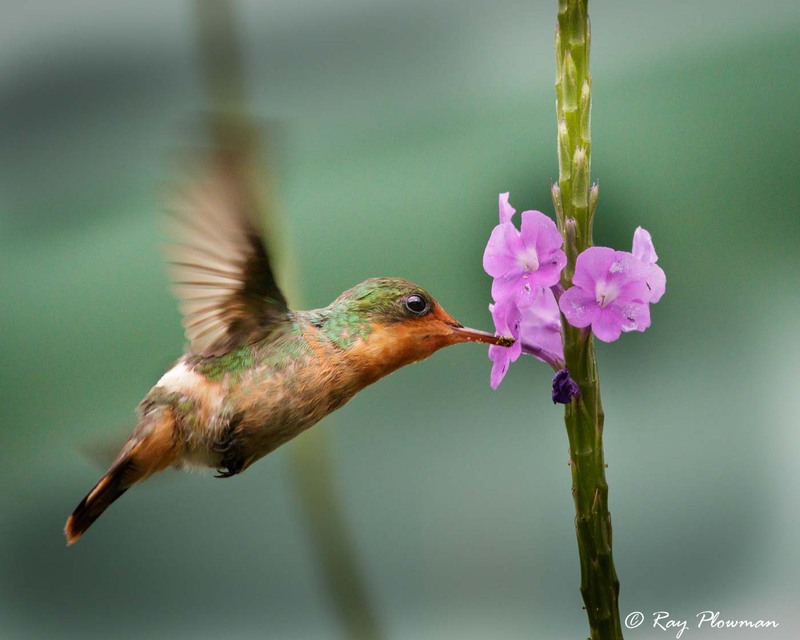 These birds are amongst the smallest bird species; are highly specialised often seen hovering around flowers to feed on nectar. 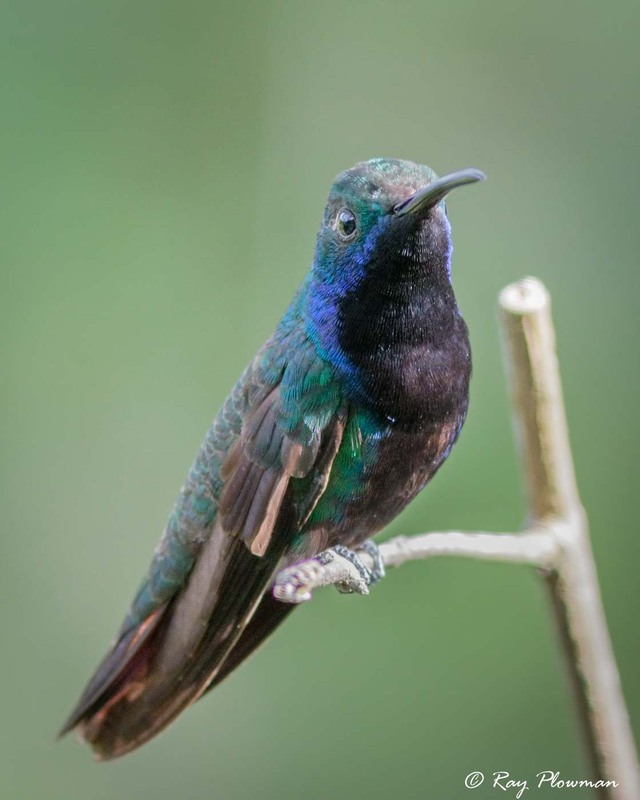 A second gallery displays hummingbird behaviours such as perched at rest, flying and h0overing and feeding on nectar. Images of showcased species are currently ‘Red List’ assessed as ‘Least Concern’. 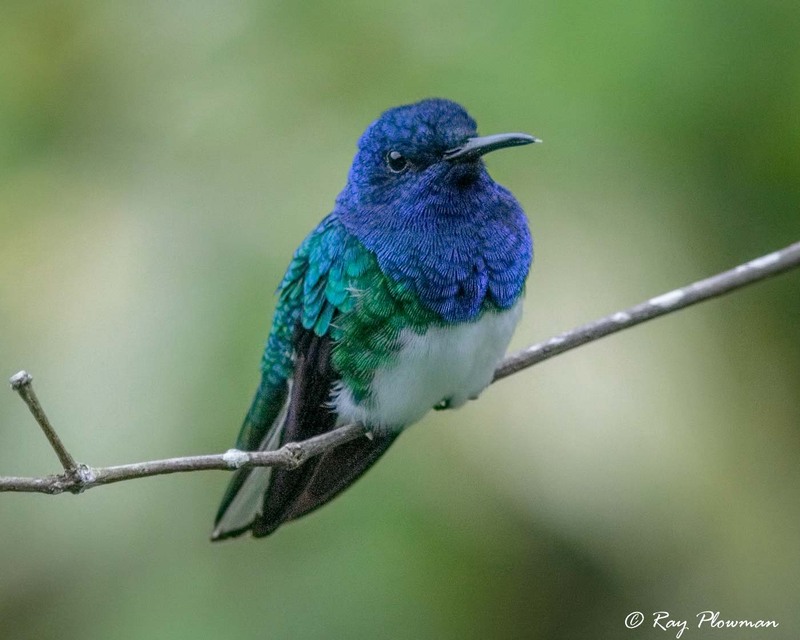 I photographed them in forest and garden habitat at Asa Wright Nature Centre(AWNC) and Lodge in the forests of Trinidad’s Northern Range. 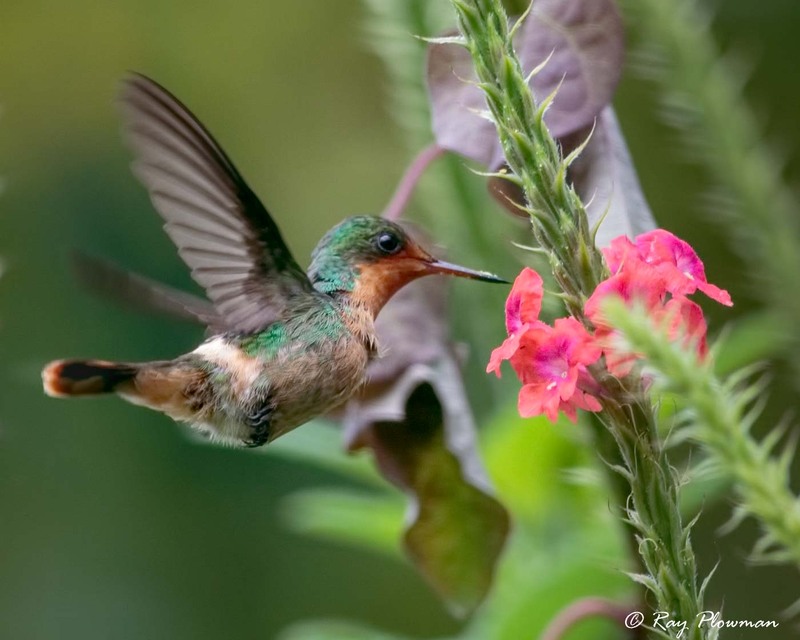 The centre has several walking trails, a large garden with Vervain shrubs and Mimosa trees that attract some species of hummingbird. 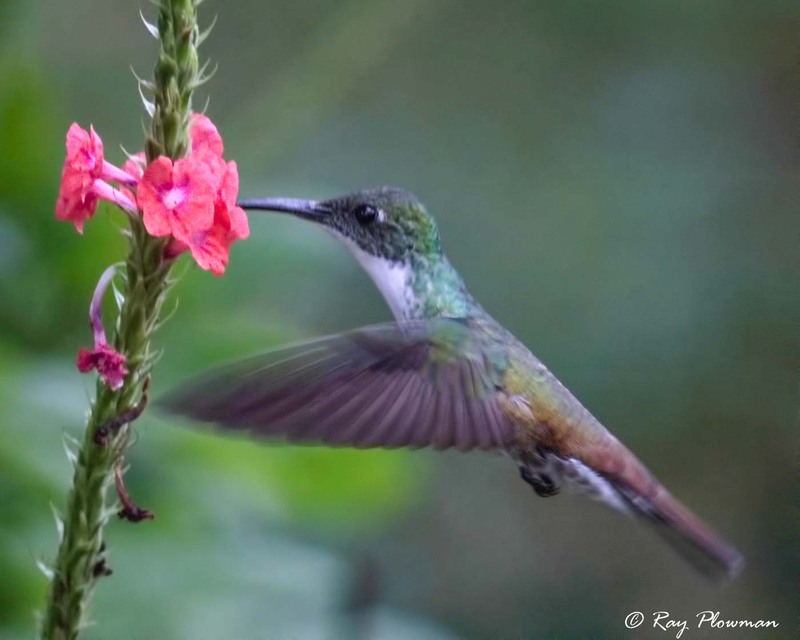 I’ve never had the opportunity to photograph hummingbirds before I went to Trinidad. 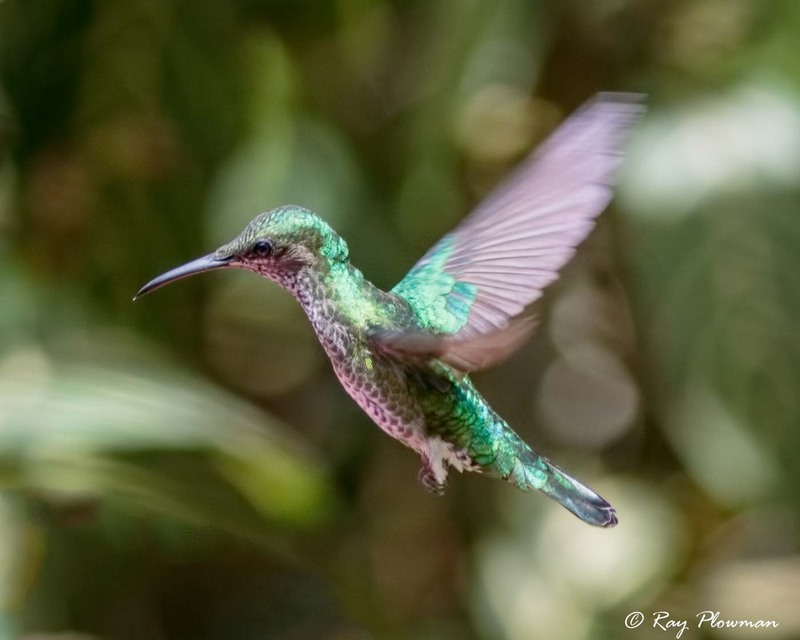 I was expecting a challenge as they flap their wings at around 50 to 70 beats per second; the resulting noise this makes gives them their name. 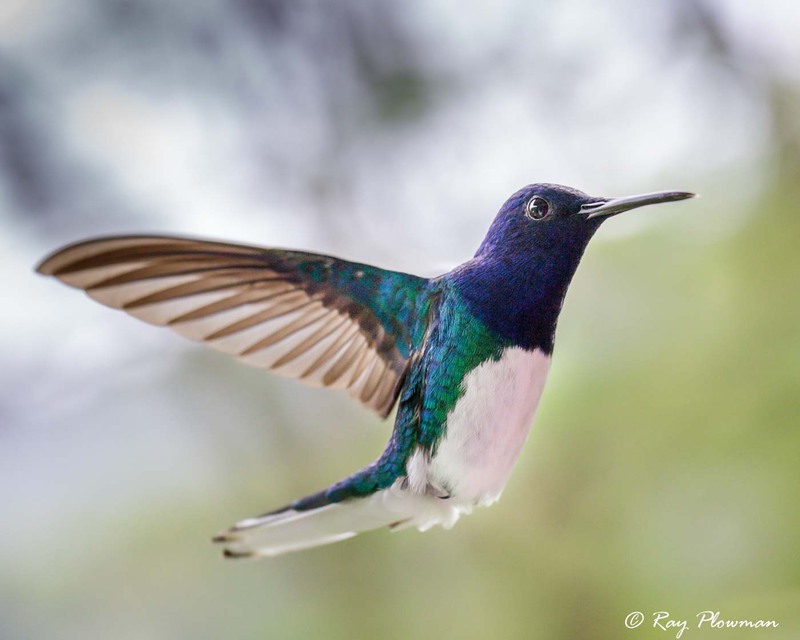 They can fly at 25-30 mph (40–50 kph), dive at 60 mph (95 kph), hover fly forwards and backwards. 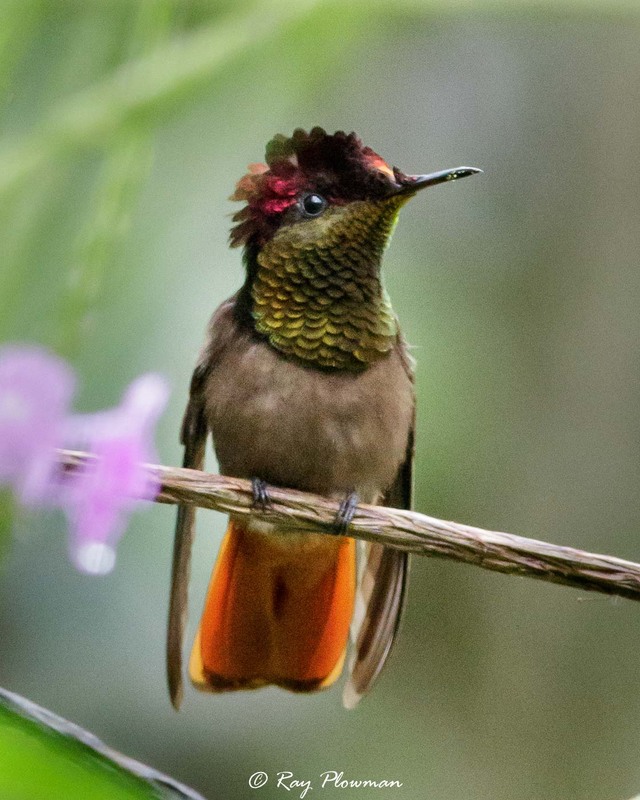 The smallest of the six species that I photographed was the Tufted Coquette, which is about 5 cm to 7 cm, weighs less than 3 g and the largest a Black-throated Mango at 11 cm and weighing mere 7 g.
Most hummingbirds have pigmentation feathers and iridescent feathers making up their plumage resulting in brilliant colours. Iridescent colours are the result of light diffraction, which changes with both viewing angle and lighting conditions. 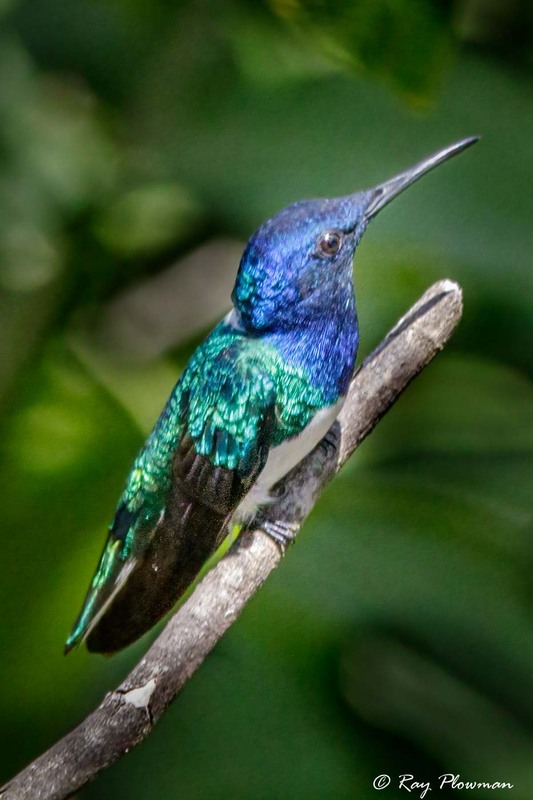 Iridescence often results in the metallic sheen. 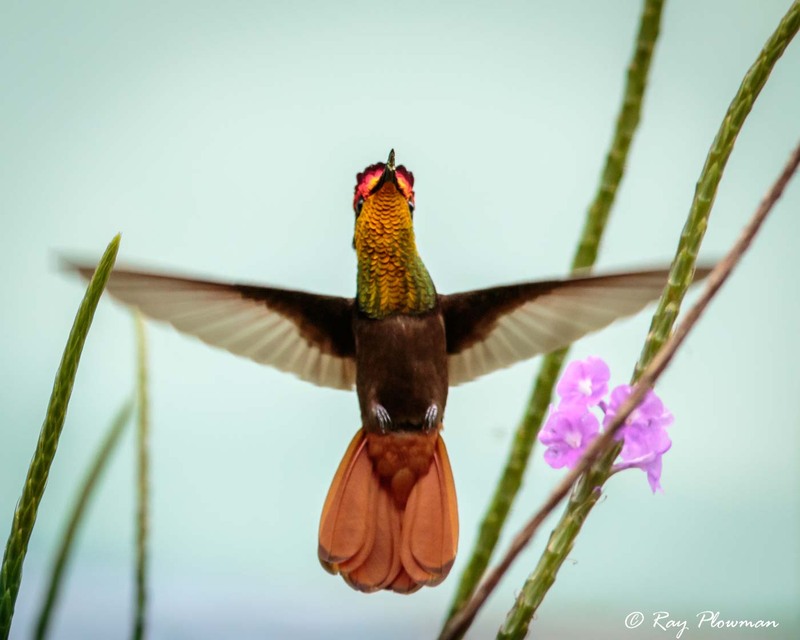 At certain angles, the gorget (throat feathers) appear black with no reflected light but as the viewing angle changes the refracted light becomes visible resulting in a shimmering iridescent display. 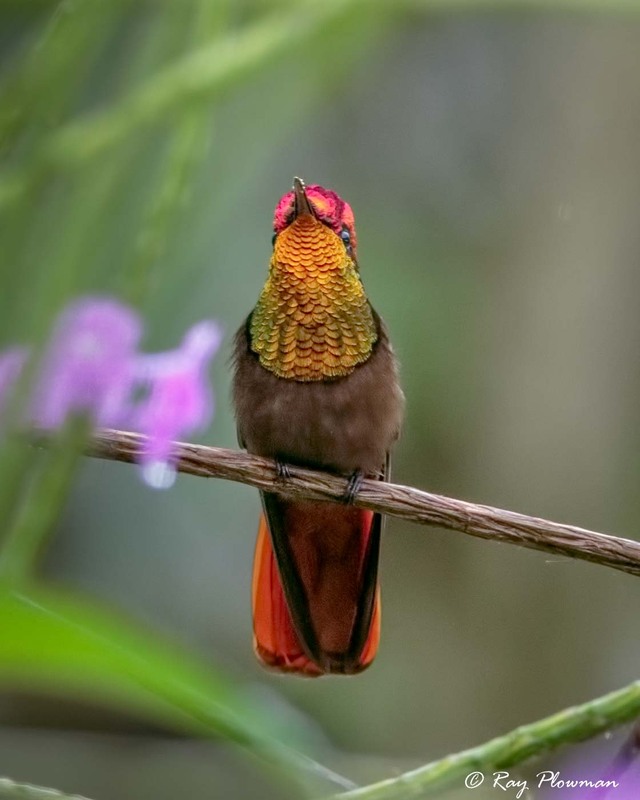 Images in the photo galleries below show iridescent throat feather effect for both the Tufted Coquette and Ruby Topaz. 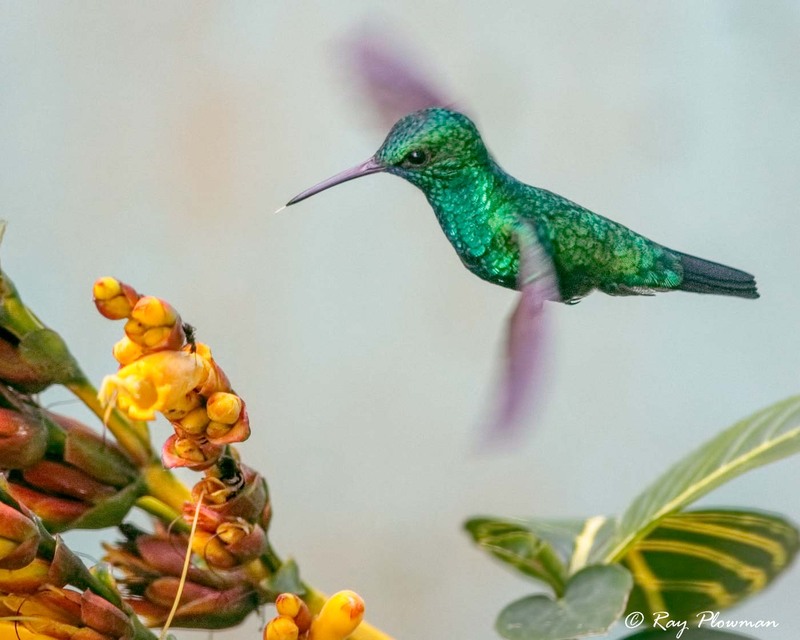 Only the male hummingbirds have brilliant iridescent throat feathers, which they use for display. 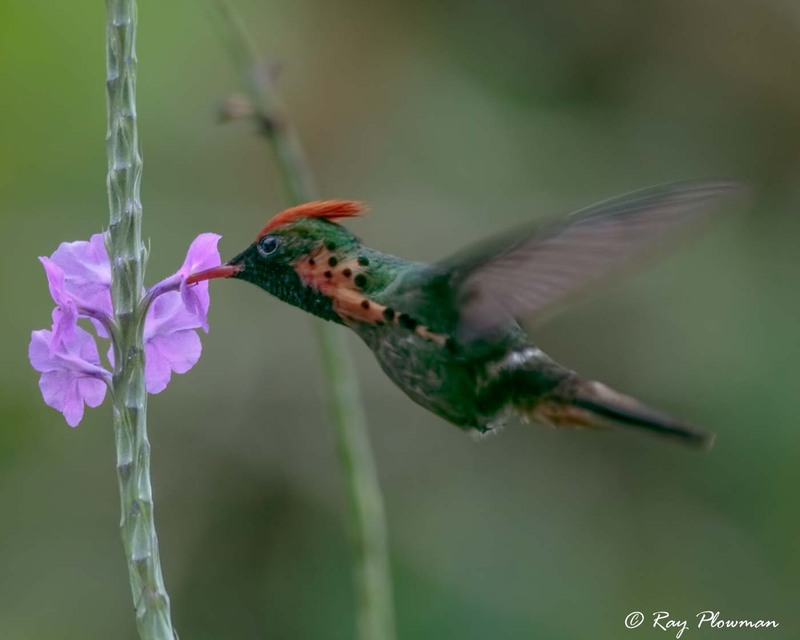 I photographed both male and female tufted coquette hummingbirds feeding on nectar of mauve and purple flowered snakeweed and red flowered changeable velvetberry. 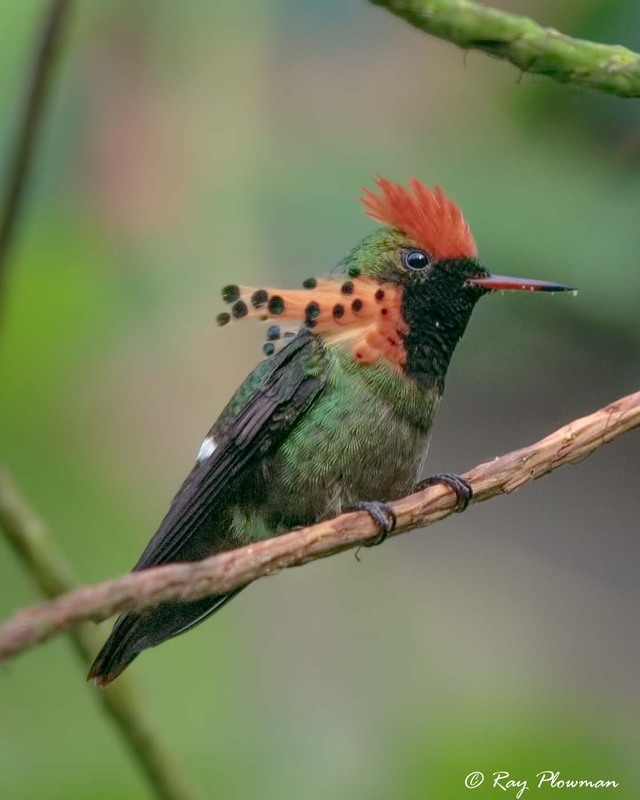 The male tufted coquette has a shaggy crest with orange check feathers; the female is less spectacular lacking both the crest and orange check feathers. Despite their speed and size, these little birds soon became my favourite to photograph. It was more difficult to find them perched than flying. 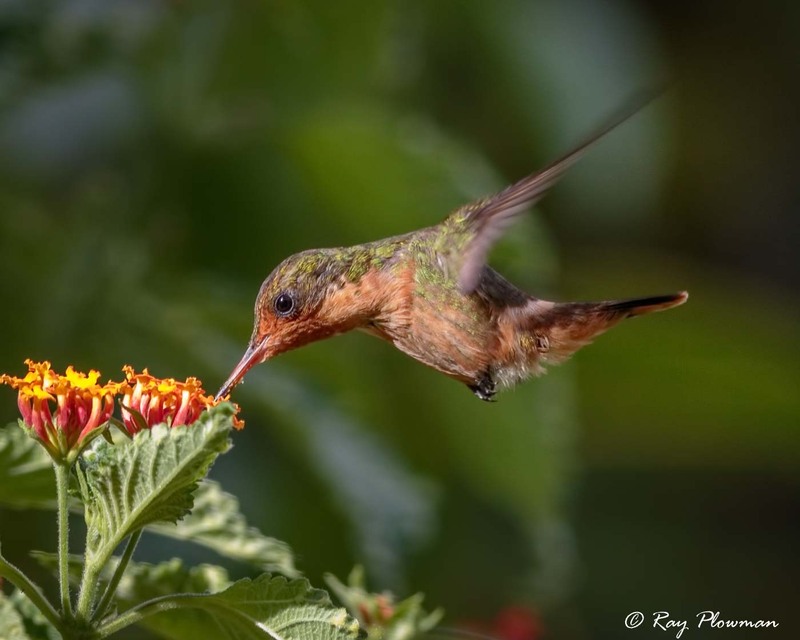 I found an area at AWNC’s garden where a ruby-topaz visited in the late morning and early afternoon to feed on purple snakeweed. 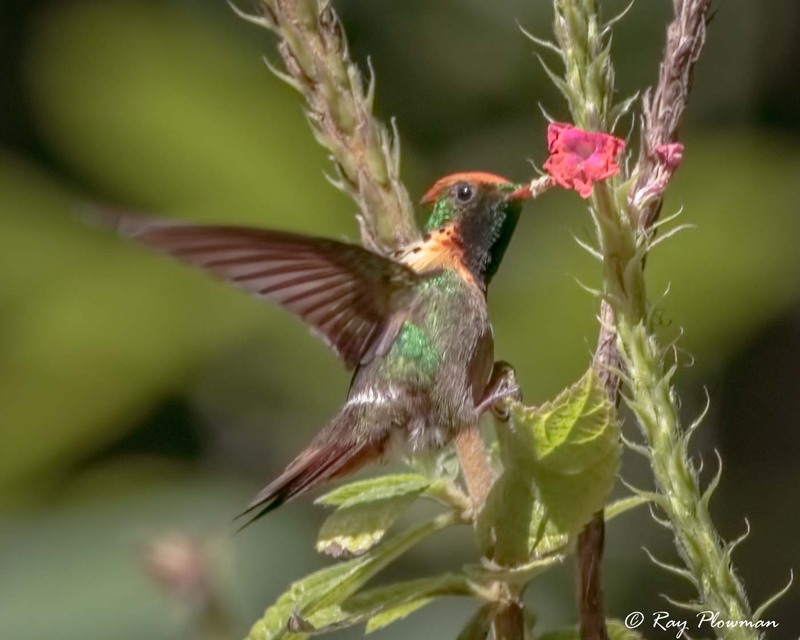 With patience and returning frequently, I was able to capture a few images of the bird feeding, flying and perched at rest. 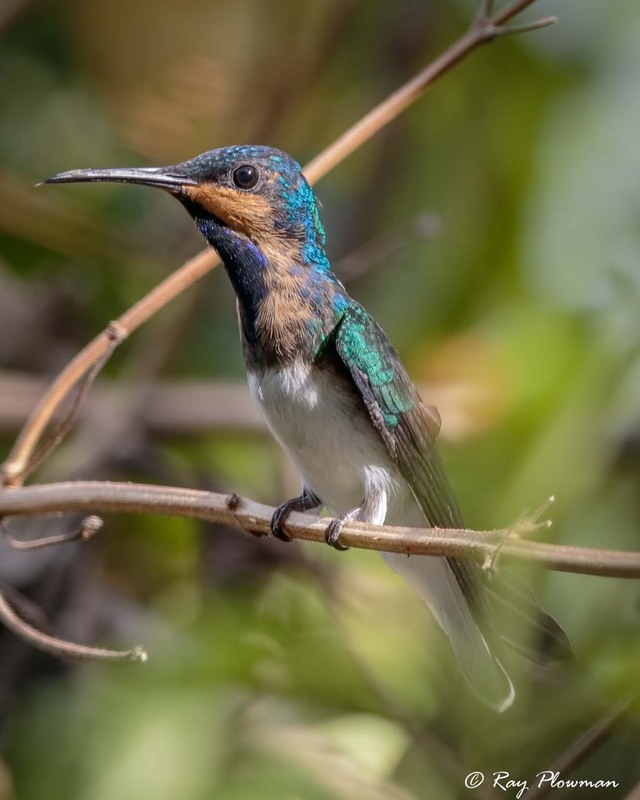 The white-necked jacobin was a common visitor to nectar feeders on the veranda at AWNC, at 11 cm was one of the largest I encountered. 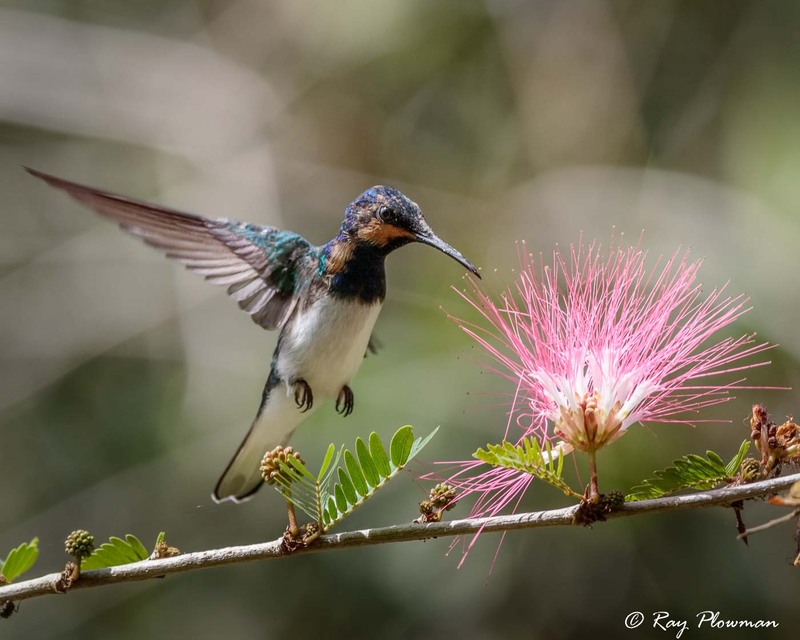 I was pleased to capture an immature male white-necked jacobin feeding on Mimosa flowers. 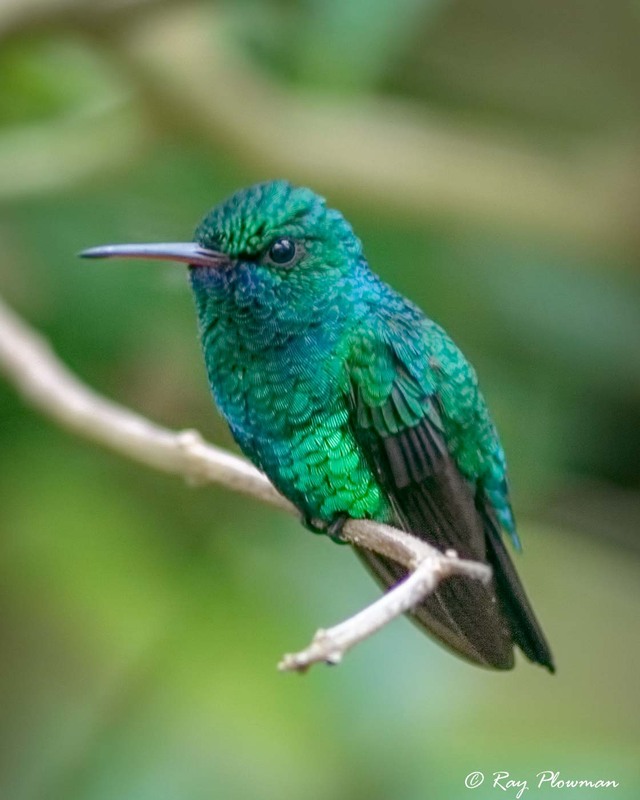 White-chested emeralds are smaller being 9.5 cm, seen perched on vervain and feeding on yellow flowers. It’s the only non-sexually dimorphic species I photographed. 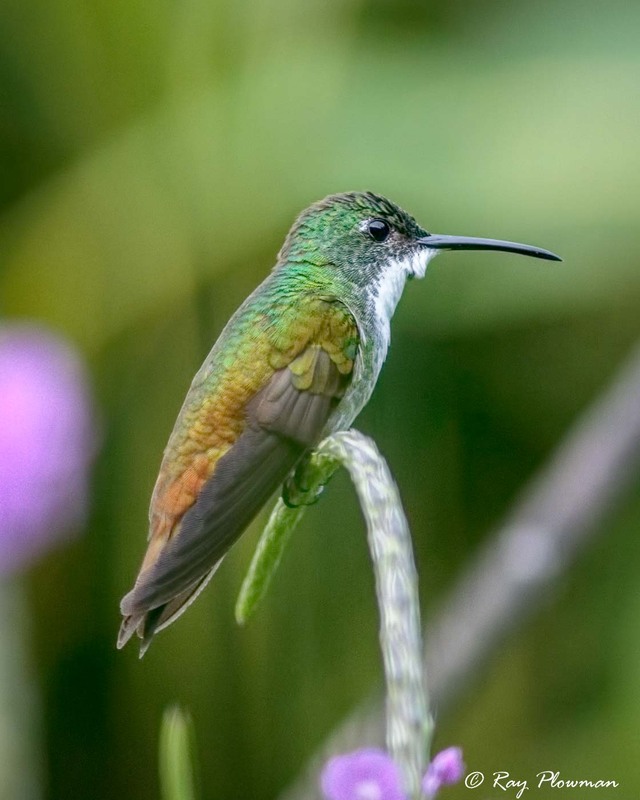 These two species were elusive, so I only have a few images of them and only one image of a perched black-throated mango. 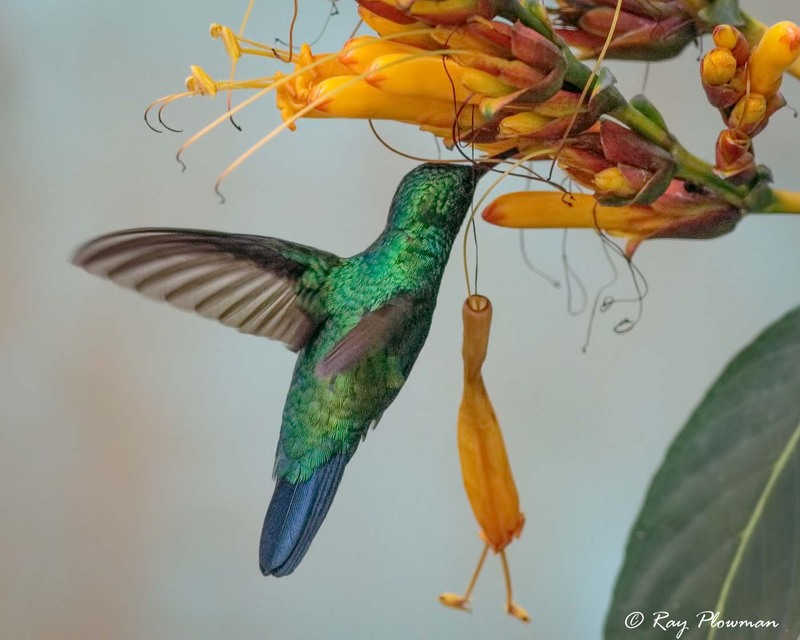 The blue-chinned sapphire was visiting yellow flower Sanchezia at AWNC’s garden to feed. 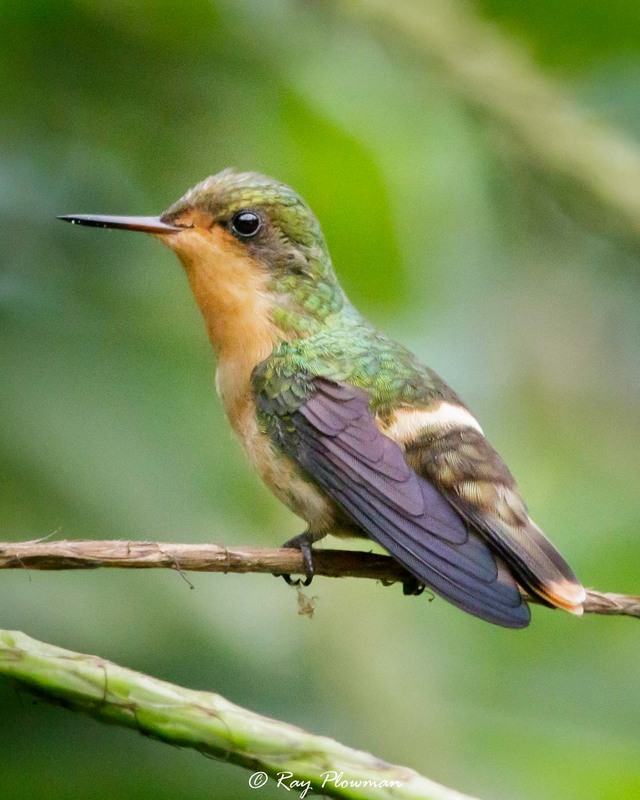 Hummingbirds (Trochilidae) family were traditionally placed in Order Apodiformes but has split. 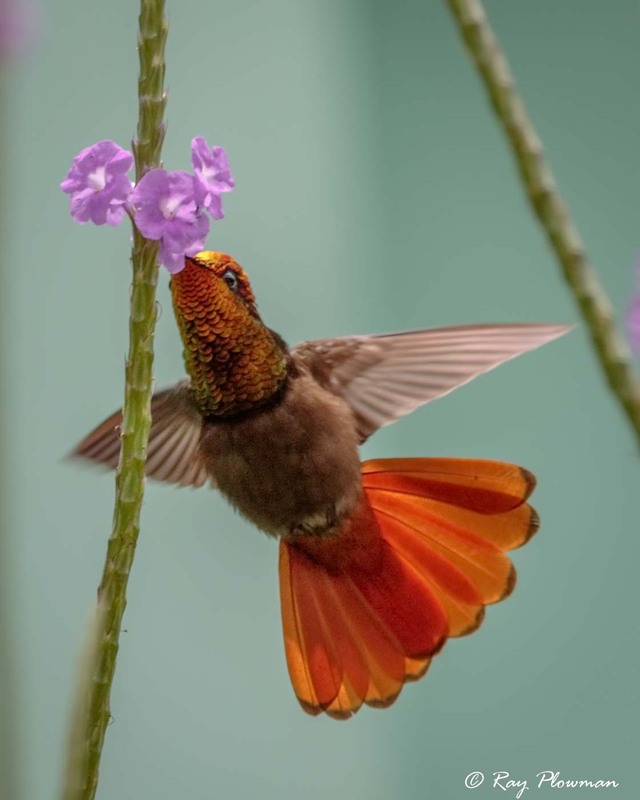 Snakeweed (Stachytarpheta jamaicensis) is a Caribbean native plant while changeable velvetberry (Stachytarpheta mutabilis) is an introduced species, both are part of Verbenaceae family. Yellow Sanchezia (Sanchezia parvibracteata) is a tropical South and Central American native plant from Acanthaceae family.